This important, explosive report forcefully argues that the "war on drugs" is largely a sham, as the U.S. government is one of the world's largest drug pushers. The authors unearth close links between the CIA and Latin American drug networks which provide U.S. covert operations with financing, political leverage and intelligence. CIA-protected Panamian ruler Manuel Noriega supplied drugs, pilots and banking services to Honduran and Costa Rican cocaine smugglers who were partners in Reagan's support program for Nicaragua's Contras. Together, Honduran and Costa Rican traffickers supplied one-third of the cocaine smuggled into the U.S. in the 1980s, according to the authors. The Bush administration showers hundreds of millions of dollars on Latin American military elites in Guatemala, Colombia, etc. to enlist them in the "war on drugs." In so doing, charge the authors, the U.S. risks empowering the very forces that protect drug-pushing crime syndicates. The U.S. also gave covert aid to Afghan guerrillas who smuggled drugs in concert with Pakistan's military--an operation that produced half of the heroin consumed in the U.S. during the 1980s. Scott, a professor at UC-Berkeley, and San Francisco Chronicle economics editor Marshall call for immediate political action to end Washington's complicity. Their heavily documented book deserves a wide audience. "Cocaine Politics tells the sordid story of how elements of our own government went to work with narcotics traffickers, and then fought to suppress the truth about what they had done. The ways and means by which U.S. government officials joined forces with cocaine criminals, and then engaged in a largely-successful cover-up to hide the truth, are meticulously documented by Marshall and Scott, making Cocaine Politics essential reading for anyone interested in understanding the real Iran/Contra story." "This important, explosive report forcefully argues that the 'war on drugs' is largely a sham, as the U.S. government is one of the world's largest drug pushers... Scott and Marshall call for immediate political action to end Washington's complicity. Their heavily documented book deserves a wide audience." "[Scott and Marshall's] account of the various interlocking connections between the Contras, Manuel Noriega in his earlier incarnation as CIA henchman and the agency itself is unlikely to be bettered soon." 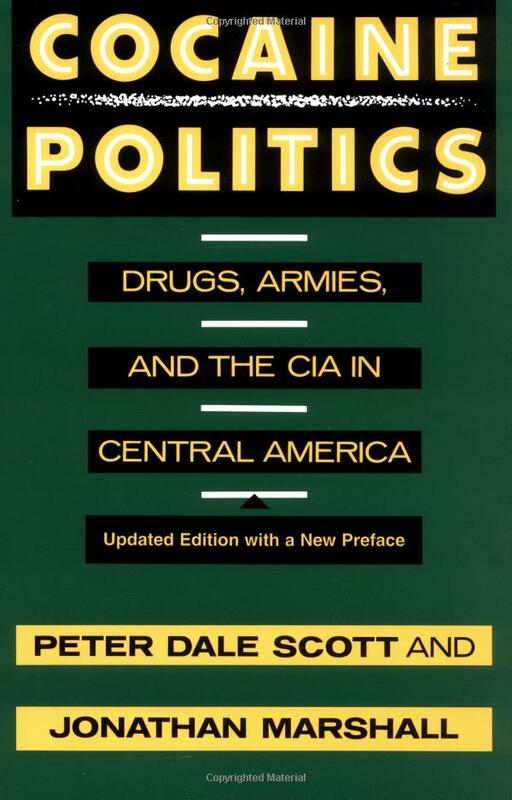 "Combing through hundreds of documents, conducting interviews with government officials, journalists, mercenaries and drug dealers, Scott and Marshall piece together the complex picture of the convoluted contra-drug trafficking scandal, U.S. involvement in covering it up and how the entire episode mirrors past CIA handling of right-wing narcotics operations." "For the evidence that narcotics... have been instruments of U.S. foreign policy, you simply have to read Cocaine Politics. This, one the most enlightening books of the year, will redefine your usage of the silly term 'drug war'. When you see those two words from then on, you will think of a covert war financed by drugs."